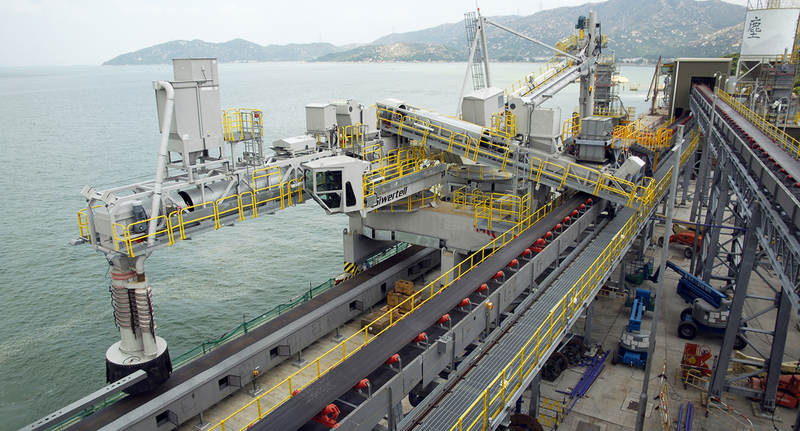 Castle Peak Power Station’s combined Siwertell unloader/loader saves space on the jetty and maintains an environmental focus with dust-free loading of gypsum and unloading of limestone. With the environment in mind, Wuhan Kaidi Electric Power Environmental Co Ltd ordered a combined Siwertell unit for its Castle Peak Power Station in Hong Kong. It has been operational since 2010 and currently handles the import of limestone and the export of gypsum. 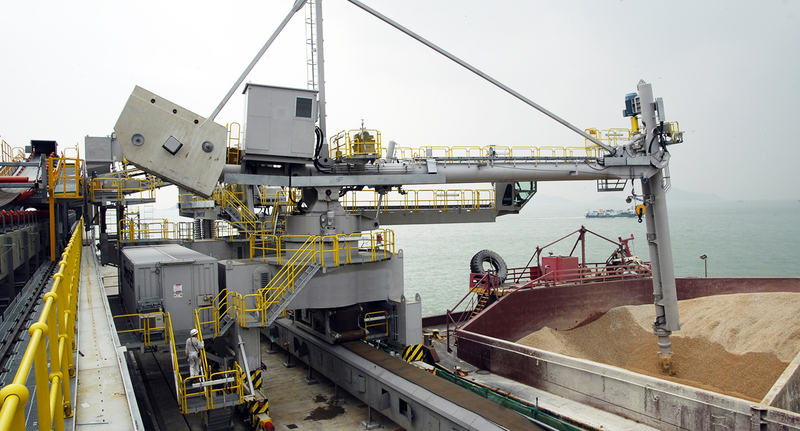 The combination of unloading limestone and loading gypsum is an excellent solution. The power plants use limestone for cleaning exhaust gases, while the gypsum is a by-product from this cleaning process. By using one unit, the power plant has a cost-effective tool to handle both imports and exports. The unloading operation is carried out by a traditional Siwertell screw conveyor system, which is well known for its reliability and dust-free operation. The loading operation employs a loading boom based on a belt conveyor and a special loading bellows system, which transfers the gypsum from the plant into open barges. To guarantee a dust-free operation, both parts of the unit are equipped with dust collectors that create negative pressure in the conveying lines. In addition to environmental considerations, one of the reasons for choosing a combined Siwertell unit instead of two traditional separate units was that there were space limitations on the jetty; the length of the jetty simply could not accommodate two separate units. 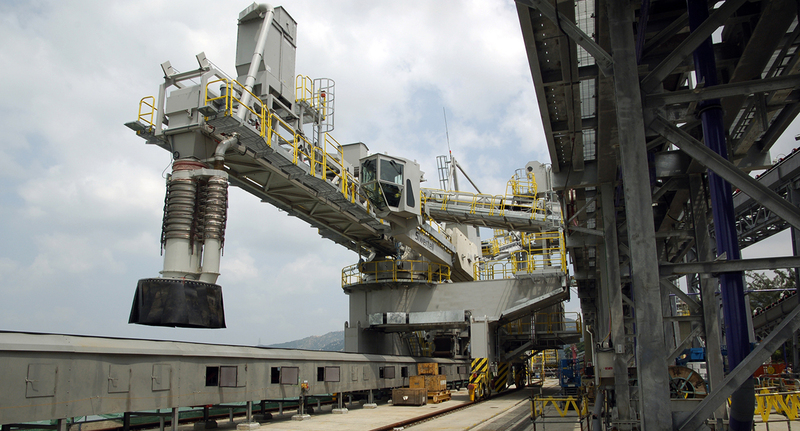 By using the same gantry for both loading and discharge operations, the total width of the unit could be reduced by almost 50 percent compared to two separate systems. The Siwertell unit has two operator cabins – one for the loader and one for the unloader – that ensure the highest possible comfort levels. Both cabins are equipped with air conditioning systems and ergonomic chairs and the operators have full visibility through the special cabin glass into the ship holds. A 10-tonne capacity heavy duty auxiliary hoist is also installed on the horizontal boom of the unloader. It is used to lift a front end loader into the ship for the final stages of any clean-up operation and is a useful addition for the crew.